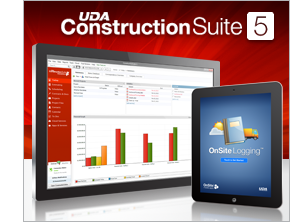 In response to growing customer demand, UDA Technologies is introducing software leasing plans, which allow use of ConstructionSuite software for a specified period of time, monthly, quarterly, or annually. These pay-as-you-go options give access to the latest tools and upgrades while providing flexible licensing without up-front investments or long-term commitments. Presenting a professional, accurate proposal to a potential client can make the difference between winning and losing a bid. Now with the improved OnPoint Document system, creating an outstanding proposal is easier than ever before. Using 12 newly redesigned proposal templates, OnPoint can take your estimate and turn it into a fully customizable, high quality proposal in seconds. With the ability to add tables and even your company's letterhead, OnPoint creates a custom proposal that is sure to make a great first impression. Time is money. And when it comes to construction projects, having accurate schedules is the key to saving you both. Enhanced OnPlan™ Scheduling with powerful new printing options, advanced PDF generation, and direct integration with ConstructionOnline Pro, MS Project, Primavera P3/P6, and SureTrak, is the new standard in advanced critical path project scheduling. Back Office, Front Office, Jobsite. One Unified System. 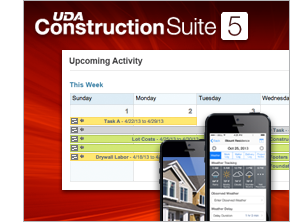 With the release of New ConstructionSuite 5 featuring direct integration with ConstructionOnline Pro, UDA Technologies is proud to offer the industry's leading combination of enterprise-strong desktop-based construction project managment software paired with the most powerful web-based construction software and the largest family of construction mobile applications for iPhone, iPad, and Android. Back Office, Front Office, and Jobsite, now you can trust a single vendor to bring your company together in one unified system. 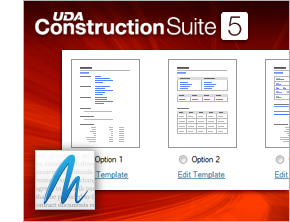 After two years of enhancements and feedback from tens of thousands of clients across North America and over 60 countries worldwide, UDA Technologies is excited to announce the much anticipated release of New ConstructionSuite 5, the industry's leading suite of desktop-based applications for advanced construction project management. 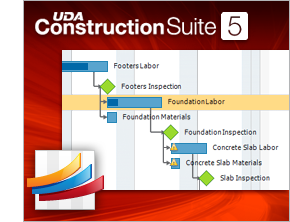 Available in 20 different specialized versions, including Residential, Commercial, and Green Building, ConstructionSuite 5 continues to define the industry standard in enterprise quality construction management software with seamless integration with award-winning ConstructionOnline and OnSite Mobile Apps. 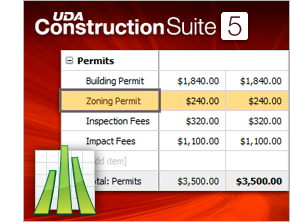 With two years of development and feedback from tens of thousands of clients, UDA Technologies is excited to announce the much anticipated release of New ConstructionSuite™ 5 OnCost™ Estimating.